After the downfall of Samsung Note 7, the smartphone manufacturing giant took a solemn oath to offer to its fanbase a remarkable product that took the form of Galaxy Note 8. It has everything that you would want from a smartphone or a desktop PC, for that matter. With a stunning architecture- both internal and external and an S Pen, all of which costs the potential buyer nearly a $1000, some might say that Samsung Galaxy Note 8 truly deserves its pricing. Although Note 8’s 6.3-inch screen is metallic, it is described as a susceptible to cracking. What’s the point in buying an expensive and gorgeous-looking gadget if it has cracks all over it, eh? That’s why you need to keep it safe & secure while making sure that you can flaunt it wherever you go. Here are 10 must-have accessories for Samsung Galaxy Note 8. The clear view standing cover case from Samsung (in Orchid Gray) is one of the posh-seeming phone cases and probably the best purchase of the year for your brand new Galaxy Note 8. It was rolled out by Samsung along with the phone’s release for the same reason. The case has a shiny appeal to it, and reflective like a mirror. You can view the screen so clearly, that time, battery life, incoming calls, messages everything is visible without having to flip the front cover. What’s more is that you can even videos or access the phone’s buttons at ease. Although the case is pretty thick, you might observe your fingerprints all over the case. But if that doesn’t bother you then this one’s a keeper. Samsung will soon roll out with a snap-on/snap-off keyboard for Note 8 if touchscreen keyboard seems a bit slow to you. This QWERTY keyboard cover pairs via Bluetooth and does not demand any alteration in the phone’s configuration either. It is lightweight and easy to put into place. 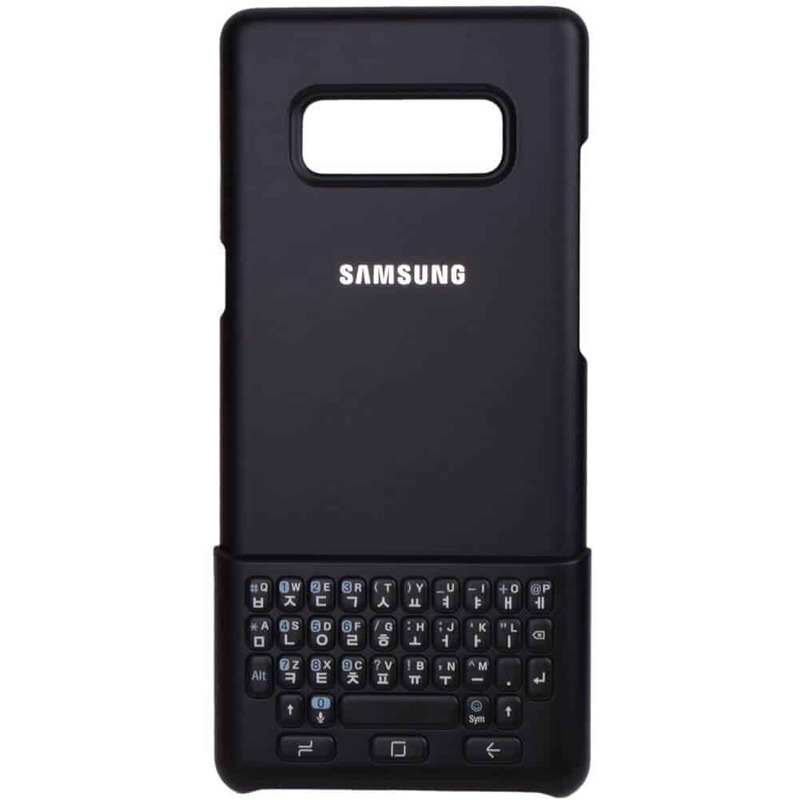 Although Samsung is yet to announce the availability and pricing of this keyboard, meanwhile, you can get a Note 8 Genuine Keyboard cover protective case (Korean-English keyboard) from Amazon for only $69. 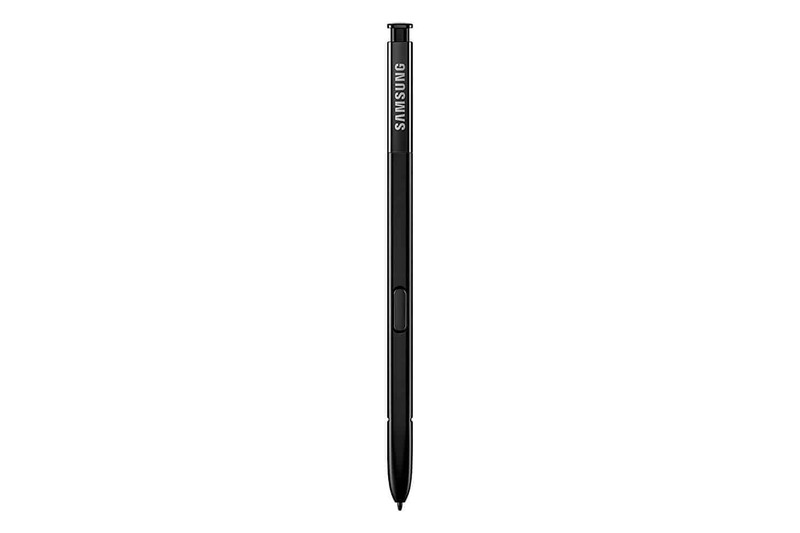 Although the proverbial phone ships with a stylus, you can have a spare S Pen for only $50 from Samsung. Note 8 has many catchy features like the Live Message feature where you can draw emojis, animated GIFs or even compose handwritten messages on photos. You can even write screen off memos for up to 100 pages, translate words and convert measurements whenever you need by simply hovering over with the S Pen. There’s so much that you can do with a stylus and that’s why it’s never too much having a spare. 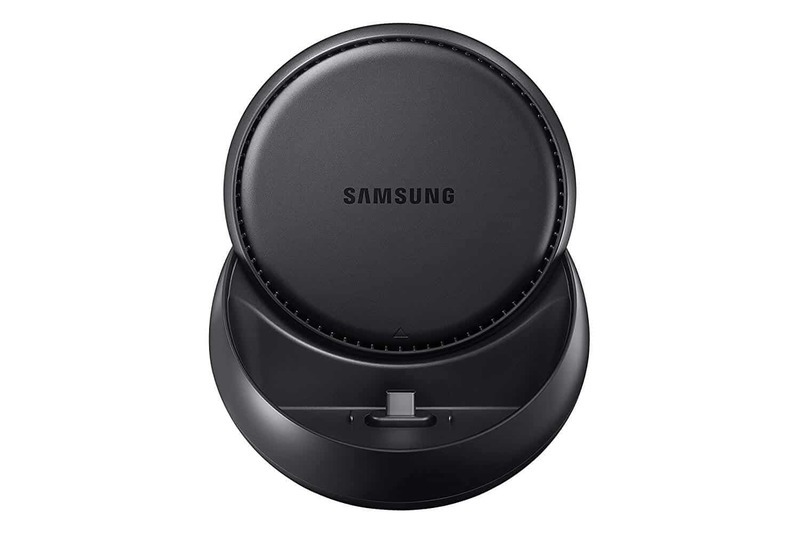 For those of you who love using smartphones instead of a desktop PC, Samsung DeX station is the perfect accessory for Galaxy Note 8 that delivers an outstanding desktop experience. It has a built-in fan to keep your phone cool while it is docked, includes fast charge travel adapter and a USB type-C cable. It also has 2 ports of USB-A 2.0, LAN Ethernet port, HDMI Output and a connector for mouse & keyboard. You can even connect the DeX Station to a computer monitor and get a Windows-like desktop experience with apps that can be resized. With DeX, you get preloaded MS Office apps, Adobe photo-editing tools like Lightroom, Samsung Internet browser, etc. You can also remotely link to a Windows machine via Virtual Desktop Infrastructure applications like Amazon Workspaces, VMWare Horizon, Citrix Receiver, etc. 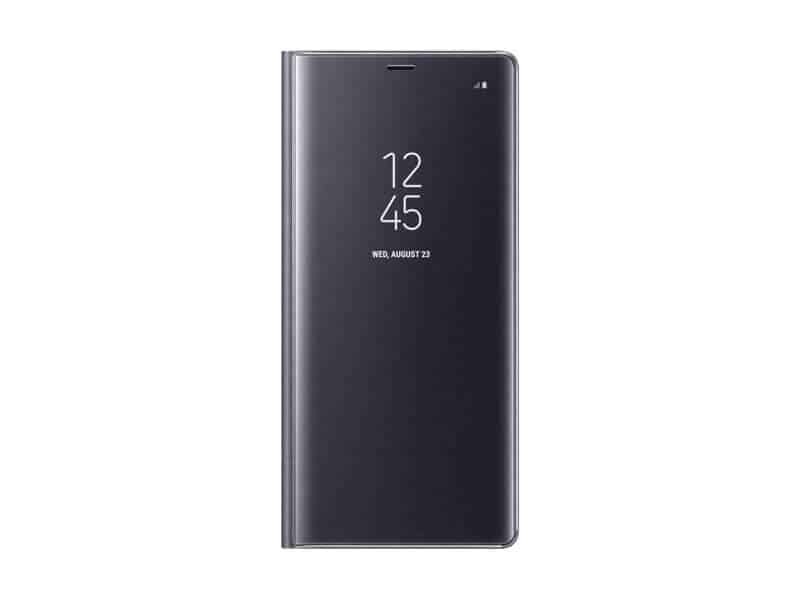 Samsung Galaxy Note 8 sports 6GB RAM and up to 256GB expandable memory via MicroSD card. 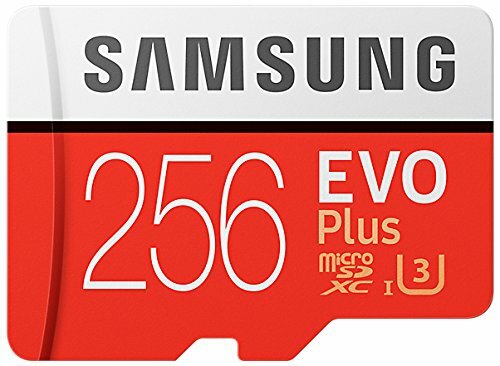 With a dynamic phone like this one, a 256GB external memory card is all you’ll ever need to experience the host of features and capabilities of this genius smartphone. Imagine this, you can store over 70K photos, beyond 2000 minutes of video. Does that sound good? The 256GB microSDXC Memory Card reads up to 100MB per second with the UHS-1 interface. It writes up to 90MB per second and is compatible with HS interface, Grade 3, Class 10, 4K HD. Offers quadruple protection from water, temperature, X-ray, and magnet. For those of you who are switching from the disappointing state of iPhone to Samsung Galaxy Note 8 for the very first time, a Gear VR is a must-have accessory. It does not strain your pocket, unlike many others. Moreover, Samsung teamed up with Oculus to offer a unique mobile VR experience to the users that is spectacular for playing games and watch videos or movies. It also has a functional social media platform of its own, too! It comes with a new touch controller at a price that everybody can afford. 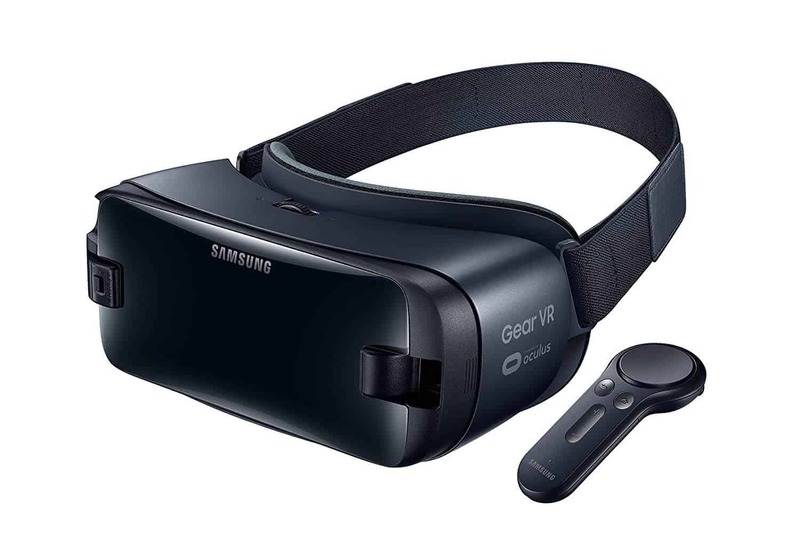 At Amazon, Gear VR costs only $99.99 but if you want to feel the thrill even further, get a VR Bundle (including Samsung Gear 360) for just $230.35. 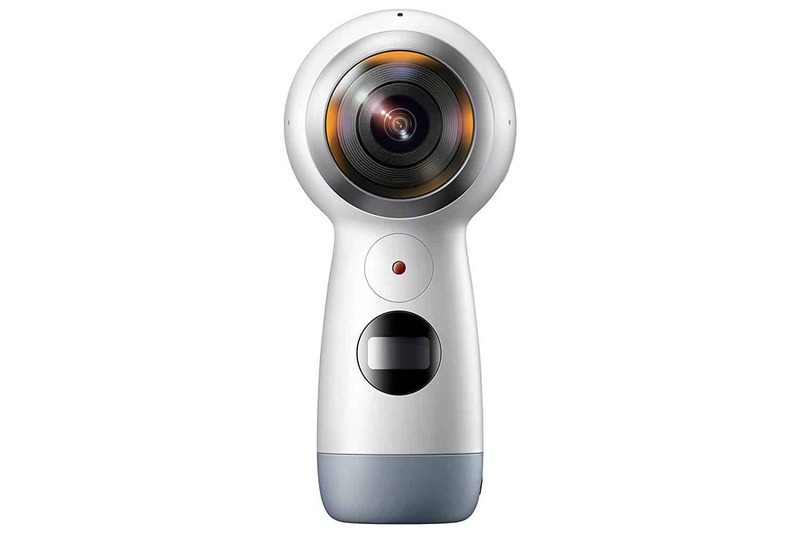 The Gear 360 (included in the VR bundle) is an accessible 360-degree camera that is top-of-the-line and works best with all Samsung phones. It is great for capturing a complete 360-degree FOV and records videos in Ultra HD. It is crafted with special care for photo and video upload to platforms most used by people- Facebook, Instagram, Flickr, etc. 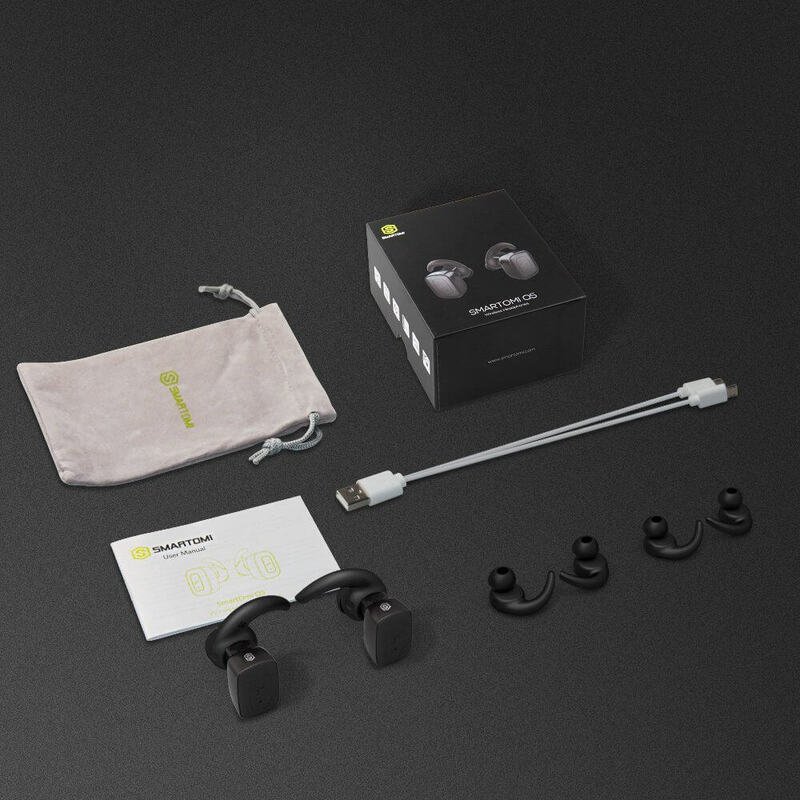 For sports and activity lovers, SmartOMi Q5 wireless earbuds are the best buy of 2018. It connects to Galaxy Note 8 via Bluetooth 4.1 and offers fast connectivity. Get rid of wired headphones once and for all and adopt wireless earbuds that sit comfortably on your ears. You can get a decent range of up to 10 meters and avail a host of features like hands-free calling, redialling, answering calls. Its audio quality is also top notch and built especially keeping in mind the busy lifestyle that athletes lead. The best part- you get a 60-day no reason return with 18 months of warranty. Galaxy Note 8 is surely an expensive purchase of 2018. If you’re keen about protecting it and making it through this year without having a crack on the screen then investing in a Whitestone Dome Glass Tempered Glass screen protector is the best way to go about it. 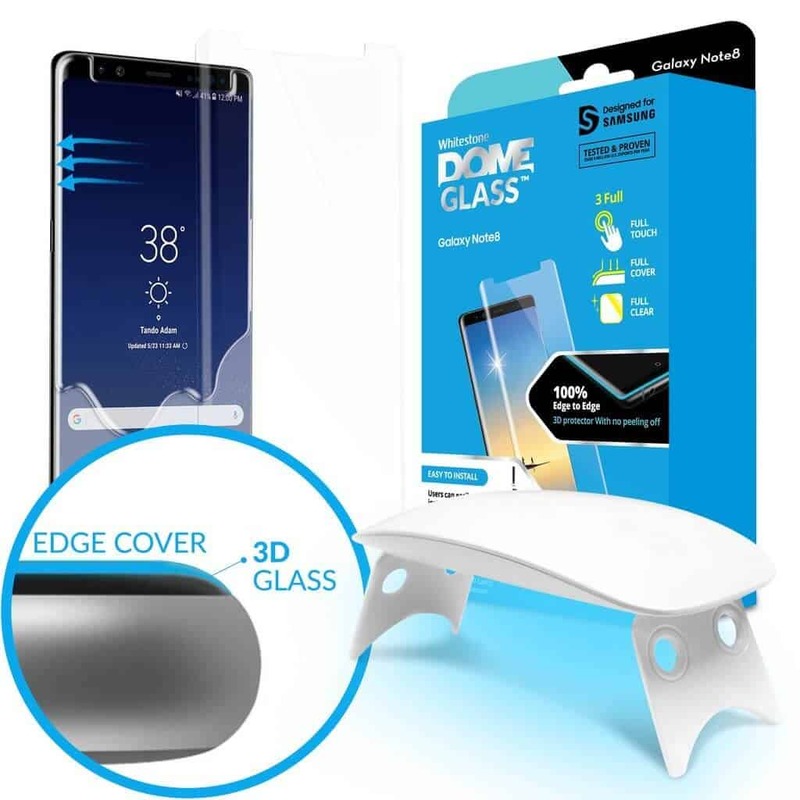 It comes with a special UV machine and a liquid adhesive that allows you to apply the glass screen protector effectively to protect the whole screen. Whitestone Dome Glass is a premium accessory crafted for Note 8 that keeps your visual aspects clear as water, yet does not affect your touch sensitivity. Interestingly, it is super tough and can handle the accidental drop of your phone, perhaps why the company, Dome Glass, offers a limited lifetime warranty. Currently, there’s no other competitor that offers protection around the rounded edges like Whitestone Dome Glass does. Big fan of USB charging? You’re in for a real treat. The Anker PowerCore with speed charge 3.0 is a portable charger upgraded with PowerIQ and one of the must-have accessory for Galaxy Note 8. Anker is a famous company that offers a USB charging capability to iPhones and Samsung devices including the Note 8. 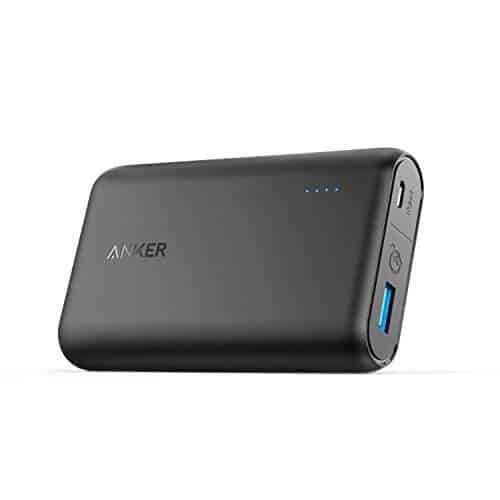 It has a Qualcomm Quick charge 3.0 with Anker’s proprietary PowerIQ and voltage boost technology to speed up the charging process to any USB device. It has an Anker patented heat-control technology built-in that ensure PowerCore speed that never overheats. So, what are you buying? The buzz about Galaxy Note 8 is here to stay for at least 2018. With more accessories flooding in from Samsung and third-parties, you would have more options than you can handle. Do let us know what you’re buying in the comments.